Zachary and I will be returning to Yellowstone in July of 2017 for a five-day trip. 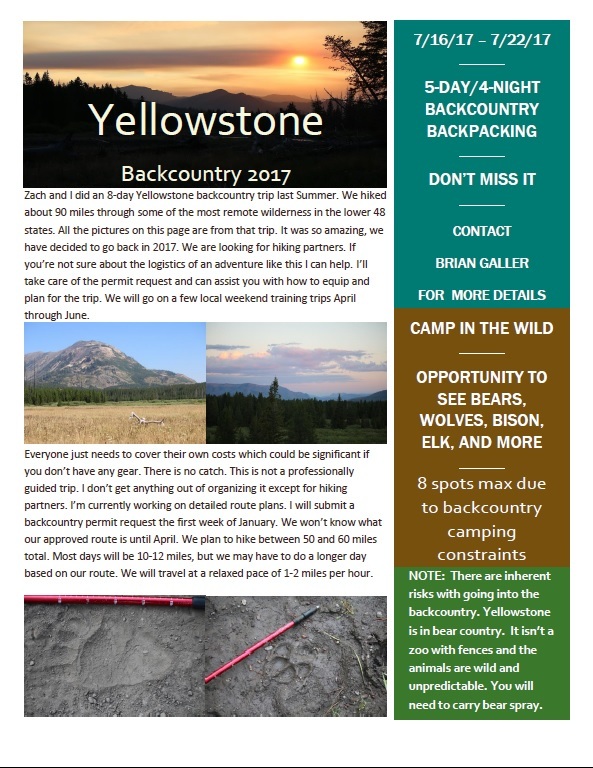 We hope to get a permit for the Northeast corner of Yellowstone. I’m submitting a backcountry permit request for something like the following route. Even if we get this route, the exact campsites could change. We may also have to hike it in reverse from what I am showing here. Total mileage, with some exploration, will be about 60 miles. The elevation changes will be pretty easy. 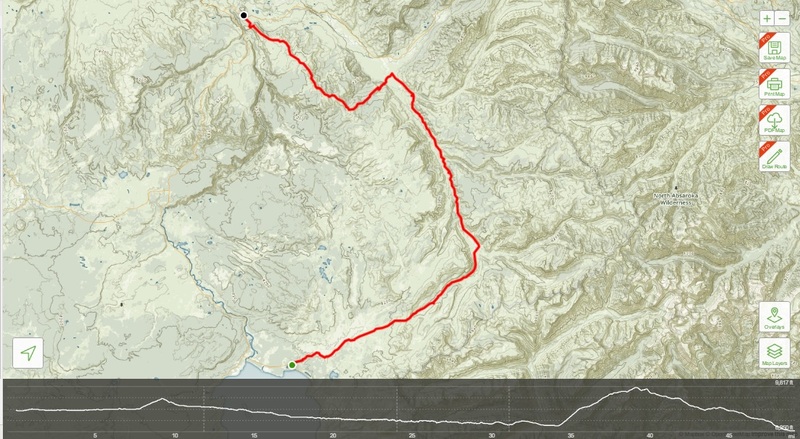 First four days (with this route) would be pretty flat and slightly downhill. The last day there is a five mile uphill climb with an elevation gain of about 2,700 ft. Once we are on top of Specimen Ridge then it is a mostly downhill hike from there. The below picture shows the possible route for each day. 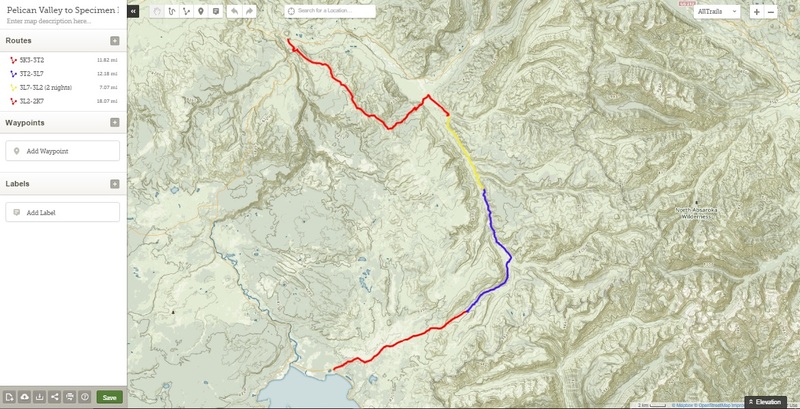 The planned route is to start at Yellowstone Lake and travel Northeast (red) through Pelican Valley for about 12 miles to campsite 3T2. Day 2 (blue) we would finish Pelican Valley and start hiking along the Lamar River for another 12 miles to campsite 3L7. Day 3 (yellow) we continue following the Lamar River for about 7 miles to campsite 3L2. The plan is to spend two nights in 3L2. This puts us within about 1.5 to 2 miles of Lamar Valley. We would explore Lamar Valley on Day 4 to see if we can get some good wildlife sightings. On Day 5 (red) we would hike out about 18 miles. That is a bit longer than I would normally like to do, but unfortunately, there are no campsites along the Specimen Ridge route. It looks like about five miles of it is a tough uphill climb, but then downhill from there. We will have 15 hours of daylight so even at a leisurely pace of 1.5 miles an hour we will have plenty of daylight to hike 18 miles.